A few days ago, I, along with thousands of other Atlanta residents, was told that my water is not safe to drink. The Atlanta Department of Watershed issued a citywide boil water advisory due to a malfunction in the Hemphill Water Treatment plant. Suddenly the rest of the city was joining me in thinking about their access to safe water, which is how I spend my days as an associate professor of environmental health at Emory’s Rollins School of Public Health. Usually my focus is on conditions in the developing world, but this time the concerns were in my backyard. The first thing that many people will do in reaction to this event is to go out and buy bottled water, which was a sensible response for the duration of the boil water advisory (although you could also simply boil or chlorinate your tap water to make it safe). Unfortunately, after the boil water advisory is lifted, many people will have lost faith in their tap water, and will continue to purchase bottled water indefinitely. This has far-reaching consequences. While counterintuitive, and probably not your first thought when we are under a citywide boil water advisory, buying bottled water will in fact reduce our collective access to safe water. First, while you might think that bottled water is safer than tap water, in fact testing and standards are usually more rigorous, frequent and transparent for water supplied by public utilities. [https://islandpress.org/books/bottled-and-sold] While a boil water advisory might seem scary, in fact it is an indication that systems to ensure that we are drinking safe water are working exactly as planned. Imagine how hard it is to find out that your bottled water was recalled once it hits the market. Second, bottle water costs way more than tap water, on average 300 times more per gallon, and up to 2,000 times more for those standard-size bottles of water that you get at events around the city. You are already paying for clean water when you pay your taxes, why pay for it again, and at an absurd markup? Third, drinking bottled water is not a sustainable practice. You’ve probably already heard about how the plastic bottles mostly end up in the ocean. What’s more, it takes a lot of energy and generates more pollution to make bottled water. Production and transportation of bottled water generates 180 times more CO2 emissions per liter than tap water. Finally, and what I think is ultimately the most important, is that the more people buy and rely on bottled water the less support there will be for investing in the maintenance of our public water system. In many of the countries around the world where I work, there is little expectation from consumers (or the providers) that piped water should be safe to drink. We have the great privilege in this country to drink clean water directly out of our taps. That privilege is based on an extensive system of engineering standards, public health measures, and laws developed to protect our public safety. The development of systems to provide us with safe drinking water was fundamental to our country’s growth and development as an international superpower. If we reduce demand for water from public utilities, we will lose the expectation that those utilities provide us all with safe piped water. In other words, every time you buy bottled water you undermine that system, and increase the chances for the next boil water advisory, or worse, the next Flint. Of course, if you live in a place like Flint, where the public water system has been compromised, then this argument does not hold. But in Atlanta this week the city was able to rapidly spread the message about the water pressure problems, issue an advisory designed to address it, and rapidly resolve the problem. This is an indication that we should trust even more in our tap water, and redouble our investments to protect this precious resource. So please, now that the boil water advisory has lifted, join me in visiting your nearest public water fountain and taking a big sip of water, and taking a moment to appreciate our great luck in being able to do so. Karen Levy, Ph.D., is an associate professor at Emory University’s Rollins School of Public Health. Citywide Inclusive Sanitation (CWIS), an approach to urban sanitation that involves collaboration among many actors to ensure that everyone benefits from adequate sanitation service delivery outcomes. CWIS aims to help cities develop comprehensive approaches to sanitation improvement that encompass long-term planning, technical innovation, institutional reforms, and financial mobilization. The concept of CWIS has been gaining traction among development practitioners. 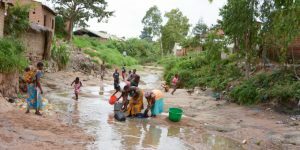 At World Water Week 2018 in Stockholm, the World Bank and other partners released an official Call to Action for all stakeholders to “embrace a radical shift in urban sanitation practices deemed necessary to achieve citywide inclusive sanitation.” This issue of Currents was compiled with help from the World Bank and the Bill & Melinda Gates Foundation. Click here to view the CWIS Workshop Video.